The primary goal of any EB-5 capital investment is to obtain approval of the EB-5 investor’s I-829 petition for permanent residence status in the United States. However, equally important to the EB-5 investor is the preservation of their capital investment as well as the ability to recoup their investment, plus any gain, at the conclusion of the EB-5 investment period. The location of the EB-5 investment in the investment project’s financing capital stack can therefore have a significant impact on the security, flexibility and ultimately the success or failure of an EB-5 investor’s investment. In the vast majority of EB-5 related development projects, EB-5 capital is invested in the form of either common or preferred equity or deeply subordinated “mezzanine” debt. This is because, among other reasons, those components of the capital stack are often the most scarce in the marketplace and are what developers are in most need of. Recently, however, as EB-5 investors become more sophisticated, in increasing cases EB-5 investors are moving toward senior debt investment opportunities. Let’s discuss the components of the EB-5 senior loan investment structure and the benefits and challenges of structuring EB-5 investments as senior loan investments with an emphasis on the goal of maximizing investor protection. LAYERS OF THE CAPITAL STACK – WHAT MAKES A “SENIOR” LOAN SENIOR? 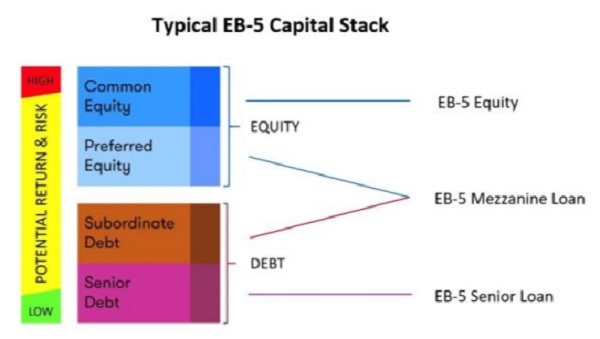 As illustrated above, there are several layers of debt/equity in a typical EB-5 project capital stack. In the most secured position is the “senior” debt, which is the first debt claim to be repaid before all other creditors in the event of foreclosure or bankruptcy. To secure a senior loan, the borrower must provide the lender with a first priority recorded security interest in its real property (mortgage or deed of trust) and a first priority recorded security interest in its personal property (UCC filing). In addition to first lien senior debt, an EB-5 project may have “subordinated” secured debt which typically consists of debt secured by a security interest against the project’s real and personal property assets that is subordinate to the senior loan. Following the senior and subordinated secured debt comes “mezzanine” financing, which typically consists of a loan that is secured by a pledge of the project borrower’s ownership. In most cases, the mezzanine secured capital will not have any security interest in the project’s real or personal property assets. In the event of a default and liquidation, the mezzanine lender can step into the shoes of the borrower and operate the property in order to preserve any remaining assets for itself after the senior secured lenders are repaid. Finally, after claims of creditors are paid, claims of equity stakeholders are paid from remaining funds/assets if any. Equity may be further divided in priority between preferred equity which has priority over common equity. A comprehensive inter-creditor agreement that provides sufficient clarity around the collateral realization process and relationship between the lender/investor parties is important to have executed at the time a transaction is closed so that all the parties understand and agree to their various roles, right and responsibilities in the capital stack. Several considerations are in play when setting the term of an EB-5 investment in a senior loan. A loan term must be established that suits the EB-5 investment timeline, which in most cases is uncertain, while still being commercially reasonable to the project borrower. It is often the case that the term of the senior loan may be longer than the actual amount of time that the investor needs to be invested in the project (6-10 years), but because of other considerations the borrower requires a longer senior loan term (20-30 years). This investment timeline discrepancy may create a risk that the EB-5 investor may be unable to recoup their investment at the time of final adjudication of their investment petition. EB-5 investor timing issues can be addressed with interest rate adjustments at certain milestones during the term of the senior in order to encourage repayment of the senior loan from the project borrower without shortening the senior loan term. In order to qualify as a valid investment in the EB-5 Program, the EB-5 investor’s capital must actually be placed “at risk” for the purpose of generating a return. In addition, the EB-5 capital investment must be placed “at risk” during the entirety of the EB-5 investor visa application or “sustainment period.” As a result, payments of principal from the project borrower, even in the form of monthly principal and interest payments, may be considered a violation of the EB-5 at risk requirements. Therefore, a straight interest only period (as opposed to a fully amortized payment schedule) must be established in the senior loan promissory note with some flexibility to extend that period to cope with likely prolonging of the immigration process due to visa retrogression for Chinese born immigrant investors. It is often the case that during the term of a commercial loan, the borrower may wish to prepay the loan prior to the expiration of it term. Such prepayment during the EB-5 “at risk” period could be catastrophic to the EB-5 investors. A lockout provision barring repayment of principal during the investment’s “at risk” period may be included in the senior loan documents to alleviate this issue. Lockouts are not provision that borrowers are typically used to seeing. It should be noted that U.S. Citizenship and Immigration Service (USCIS) has recently opened the door for capital redeployment after job creation from the initial EB-5 project investment through its most recent policy manual revisions. This means that the lockout provision may become less important in future EB-5 senior loan investments. Most, if not all EB-5 projects, include a significant amount of construction. Management of construction risk represents perhaps the single greatest challenge to the success of any EB-5 project. The senior lender’s first priority lien position in the capital stack allows the senior lender to require additional layers of control and protection on behalf of the EB-5 investors including, but not limited to, requiring that the subject EB-5 investment project include a thorough funds control process consisting of construction monitoring, site inspections, draw requests, proof of incremental progress, lien release collection and other processes vital to ensuring a healthy and successful construction project. The prudent senior lender typically employs an outside third party construction management firm to conduct regular site visits to the project, prepare detailed progress reports and ensure that all materialman’s liens have been satisfied prior to allowing further funds to be disbursed into the project. This type of careful construction management will help keep the project on track and will serve as an early warning detection system for any problems before they can spiral out of control. Being in the senior lender position, EB-5 investors can ensure that their interests are protected by requiring that a rigorous funds control process be in place for their EB-5 investment project. A senior loan structure provides many benefits for EB-5 investors that are not available to other investment positions in the project capital stack, ranging from control over the project’s investment debt to the increased flexibility to refund EB-5 investors in the event of a troubled project situation as well as the ultimate ability to recover the EB-5 investors’ investment funds after final petition adjudication. Meanwhile, the senior loan is in a better position for deep engagement in construction management through a professional third party. The senior loan structure therefore can further leverage outside construction expertise in reducing the project construction risk for the EB-5 investors. On the other hand, the senior loan EB-5 investment represents the most challenging form of EB-5 investment to structure. It requires a rigorous and detailed effort along with a flexible project borrower to structure the senior loan transaction and the senior loan documents to ensure full compliance with all EB-5 rules and regulations. If successful, however, the benefits can be extremely attractive to both EB-5 investors and borrowers looking for debt to fill out their construction project capital stack. In the current climate of EB-5 investment uncertainty, providing additional security and protection to EB-5 investors using the senior loan investment structure will increase the likelihood of attracting more investors to the project. John Shen is the CEO of American Lending Center LLC. He is a pioneer in the regional center industry, where he’s introduced EB-5 capital to U.S. government loan programs, such as the SBA 504 program. In October 2017, Shen won the “Coleman SBA 504 Lender of the Year Award,” the annual award for the best small business lenders. He founded American Lending Center LLC in 2009, which received the U.S. Citizenship and Immigration Services’ regional center designation in April 2010 and a California finance lender license in November 2010.